Equipment: 2-3 hurdles 3-4 tall cones 2 disk cones and Balls. Players begin at hurdles and jump over. For younger groups, keep hurdles flat, if its too easy you can raise them. Players run to tall cones and weave through. 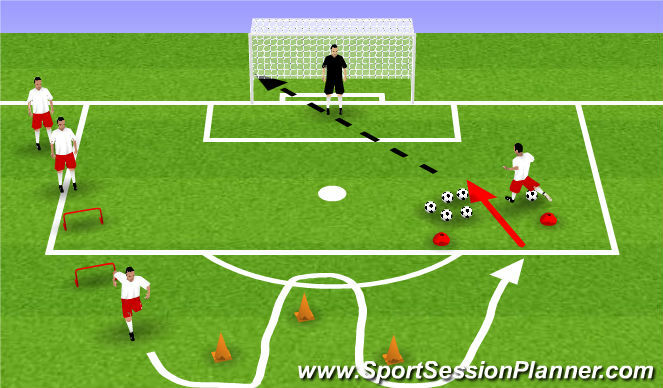 After they get out of tall cones run through the gate and shoot on net. Have a pile of balls infront of net. Coach stands in net so you are able to see the entire session. Focus on just the finishing aspect of it, dont worry about the technique over the hurdles or through the cones (that&apos;s just extra work). If the player scores they go back in line.If they miss the net they must get thier ball and bring it back to the pile.Make sure the session is continuousso players are constanly moving. Coaching points: Try to shoot with laces or inside of the foot, try to elimate kicking with the toe. Before you start MAKE SURE YOU DEMONSTRATE THE ENTIRE ACTIVITY. It will be much easier to control them within the session if they have an idea of what their going to be doing.